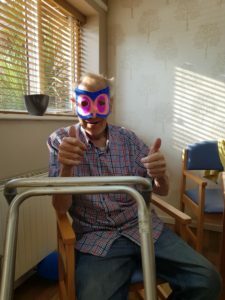 Byron Court Care Home, Liverpool has recently been focusing on creating links within the local community, these relationships have numerous benefits for those living within a care setting. Unfortunately, at times it is easy for Residents to become insular when then first move in to a care environment, developing these community links is an excellent way to involve everyone, introduce people to new faces and different ideas. There are two ways to build these relationships, either ‘bringing the outside, in’ by inviting visitors to the home or Residents going out to the local community, at Byron Court promote both of these. The Activity Coordinator from Byron Court has been working hard to build relationships with the local Church and community groups such as, the Brownies. 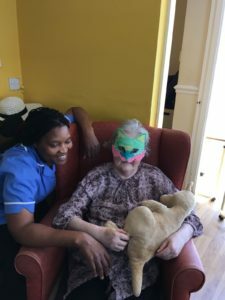 During the last visit from the Brownies, the team and Residents enjoyed taking part in a craft day making animal face masks. It was a stimulating activity which enables both parties to socialise with a different group of people than they normally would in their day to day lives. It was a lovely afternoon, full of chit chat and laughter and due to everyone enjoying the day these visits have now become a monthly occurrence. The staff at Byron Court have also worked hard to develop a relationship with the local Church. The lovely choir now attend the home on a monthly basis to entertain the Residents with a number of songs which they can also get involved with and have a sing-a-long too. A lot of preparation and time goes in to organising these events and we are grateful to both parties who attend and spend quality time with the Residents.